In all relations, the subordinate class is excessively passive or even helpless, while the dominant class is hyper-aggresive. Members of the subordinate class see themselves in terms of their value to the dominant class. Members of the dominant class engage in battles resulting from their hyper-aggressiveness. In the workplace, the dominant class is boss and the subordinate class is treated as their property, whose bodies are available for exploiting at whim. In the household also, the dominant class is boss - although derelict in duty - while the subordinate class maintains the household regardless. The subordinate class readily displays tenderness, affection and concern for others, while the dominant class is self-centered, predatory, lazy, and callous. So, of course, the viewer cheers when the subordinate class rises up against the injustice of their oppression. But wait - the film has tricked the viewer. Although the film shows the bodies of men in the subordinate class, the viewer recognizes that the conditions of the subordinate class in this fictional society mirrors the conditions of women in the viewer's real society. So what is being cheered - the end of the oppression of the men of the fictional society, that the viewer sees in the mirror? Or the end of the oppressive conditions of women in the viewer's real society, that the viewer recognizes is being mirrored? Those who view the film literally see it as a film with an anti-feminist message (i.e., the consequence of feminism is oppression of men into the roles of women), that is inconsistent with the filmmaker's history as a woman who pioneered in a man's world. 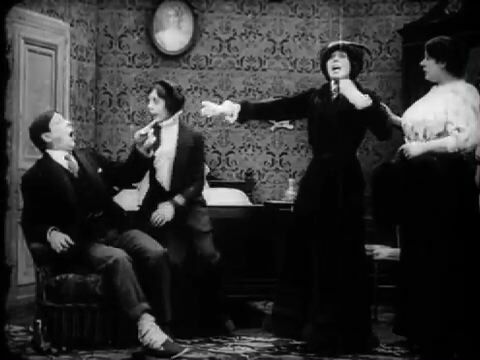 But those who view the film symbolically see it as a brilliant social satire, that spotlights much of the destructive absurdity of our gender relations, using an anti-feminist argument against itself (i.e., since the roles of women are oppressive, women are justified in banding together to end the oppression) - all in less than seven minutes. Although 110 years old, this film is still totally relevant and not the least bit dated - because there's been so little progress made. Some might say the film was ahead of its time. Others might respond that it is precisely calibrated to its time - and ours - while striving for a time that has not yet come.